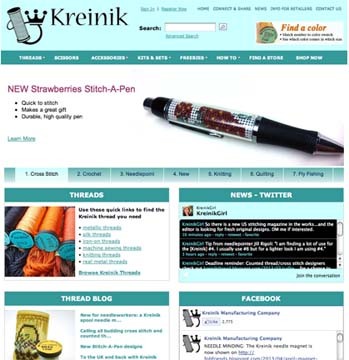 Kreinik is launching a redesigned web site this week, featuring major improvements and a fresh look. You will find better organization, simple design, faster search engine, easier ordering, and content updated daily. A fresh, updated look with a simple design. We're stylin' with a crisp, clean format that is readable and usable on your tablet, cell phone, laptop, or desktop. Drastically improved search engine. We could go on about how the new site has one database rather than multiples, but the bottom line is that the keyword search just got way better. We still have the things you love. The free projects, educational information, how-to videos, stitch illustrations, store locator, and downloadable thread color charts are still available on the new site. Uncomplicated ordering. We want you to support local independent retailers if possible, but when you need to order online, the new shopping cart is streamlined. A group of mom-and-pop, dedicated independent retailers fulfill orders made through the Kreinik site, so you will be getting the Kreinik you need from people who know about the products. The new site also features the latest in payment security technology, so the transactions are secure. 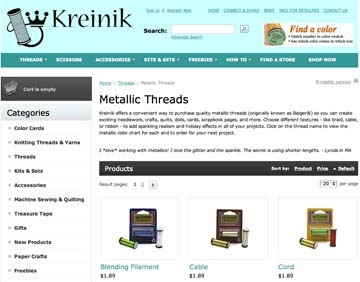 Check out the new Kreinik website here: www.kreinik.com. You may need to reload your page if you have the old site bookmarked, or clear your web browser history if you have any problems viewing it on your phone, tablet or laptop. Just hit "refresh" and get ready to be re-inspired and rejuvenated by a creative new thread world. 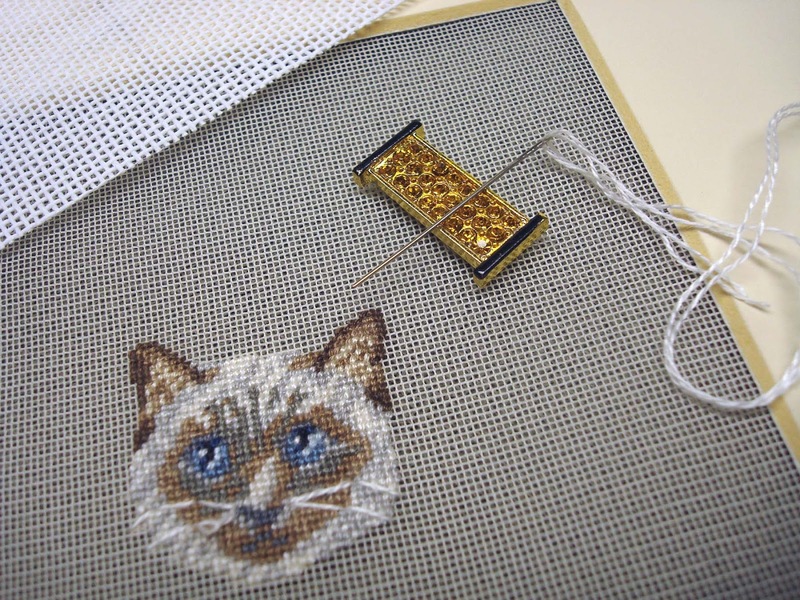 Just like any project, the new Kreinik website is a work in progress. We are still adding items and content. There are so many numbers, lines of code, images, words, spaces, and punctuation in our website that we've missed a few edits, no doubt. So if you notice any broken links, typos, missing images, etc — or have any questions — send us an email: info@kreinik.com. We appreciate your feedback on the new site or on any Kreinik products. A needle magnet is the easiest way to keep from losing your needle. If you have ever "rested" your needle in the arm of your couch, or in a corner of your project-in-progress (making holes and/or distorting the fabric), or on a coffee table (cats: beware!) then you need to know there is a better, SAFER, and certainly prettier way to rest your needle: a magnet! Needle magnets attach to your project and hold your needle when not in use. Don't use just any set of magnets, as some of inferior quality can leave dark marks on your fabric. Try it once and you realize how handy they are. There is no shame in having multiple magnets on one project, holding the needle for your metallic thread, the needle for your cotton thread, etc. These tools are designed to make your stitching life easier. 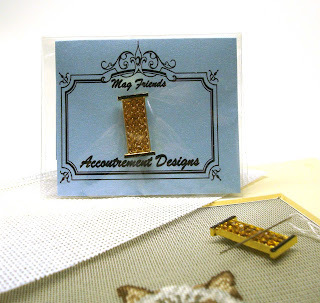 Accoutrement Designs has taken needle magnets to the glamourous level. They are sparkly and pretty and come in every theme to match every passion. Of course you need a carrot magnet for spring, a crab magnet if you live in Maryland, a sand castle magnet if you stitch on vacation, a breast cancer ribbon magnet if you are a survivor or want to remember friends, etc etc. Creator Lisa Crespo even has a a list of A Year In Magnets to really keep your needlework in-progress projects fresh and fun. We all love bling and these are fun, inexpensive ways to bring our personalities and a smile to our stitching time. Whether you are a quilter, embroiderer, cross stitcher, or needlepointer, you can use one or more of these handy tools. A few months ago, designer Sharon Garmize recommended to Lisa that she make a Kreinik spool needle magnet. There are so many Kreinik fans and Kreinik thread collectors out there, so Lisa was just as excited as we were about the concept. She got to work and now has a Kreinik Spool Needle Magnet! You can also wear it as pin — the new fashion must-have for…guild meetings, stitching groups, oh well, anywhere! It will be a conversation starter. The new design is debuting at Lisa's spring 2013 trade shows. 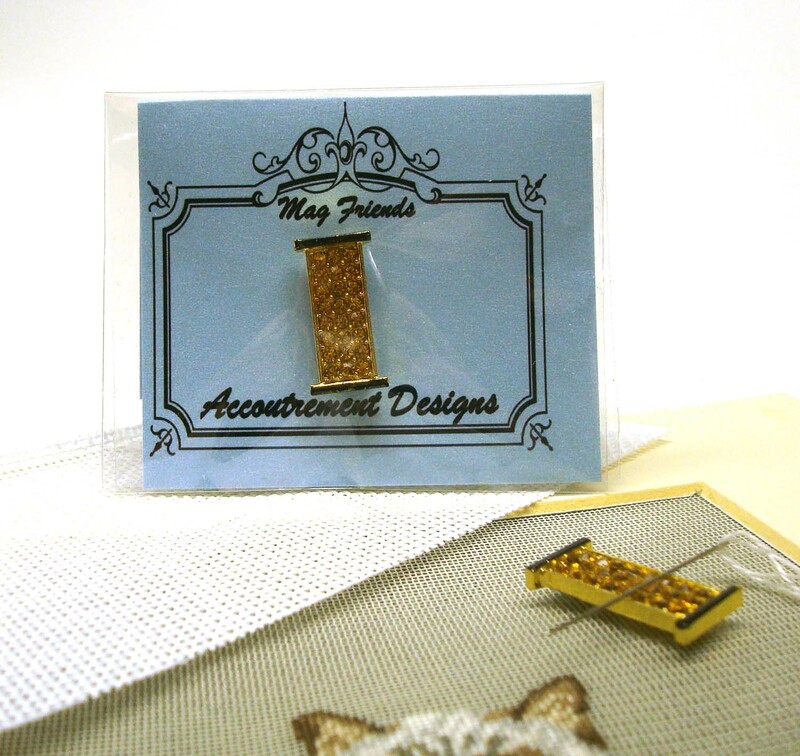 Ask your local needlework store to get the Kreinik Spool Needle Magnet for you, or contact Accoutrement Designs for more details: http://www.fobfriends.blogspot.com/. The blog also has a list of stores on the right side of the page; contact those retailers to order online or via mail order. Stores can contact Lisa through http://www.accoutrementdesigns.com/.